Pre-book your personal mobile internet hotspot. Connect to the Spanish 3G network and avoid data roaming charges. Rent a portable internet modem and connect up to 8 devices simultaneously. 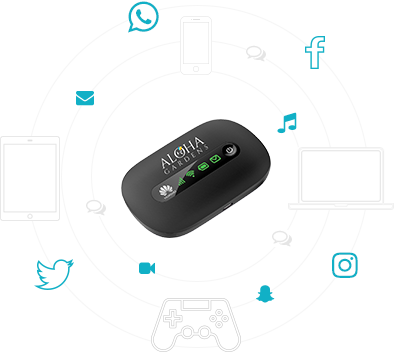 Whether you are staying at Aloha Gardens or elsewhere, this handy little mobile device is an ideal way to get connected throughout spain. To book your WIFI in Spain complete our 2 step process below, then simply collect and pay on arrival at Aloha Gardens Reception. Simply choose your start date and use the slider to select your duration. Complete your details and process your order. Please select your WIFI start date. Then use the slider to select your rental period which will automatically complete the end date for you. The WIFI Router is not seriously damaged, such as a broken screen. The WIFI Router is returned in the box with the charger, battery and SIM card. The date that the WIFI Router is returned is no more than 12 hours after that which is specified on the order.